So first there was the online creation of pretty simple items like business cards and T-shirts – businesses which cut out the old middle-man way of doings things. Soon there will be a way to create and “print” objects in 3D on a mass scale, and the first of these is starting to arrive. Netherlands-based Shapeways is launching a private beta of a community for consumers wanting to create real objects. Eventually you’ll be able to share and co-create online as well. 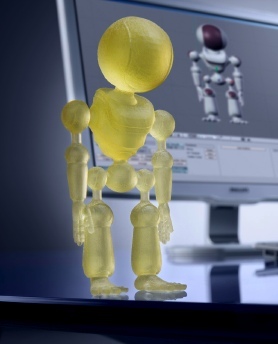 Imagine you wanted to create a 3D dummy of a new type of Web tablet. You just upload the design from some CAD software onto the site. Shapeways checks whether the object can be made and provides a real-time cost estimate. Within 10 working days, a tangible 3D product is produced and shipped globally. At the moment they only print to four kinds of plastics but other materials, like metal, are planned. To reproduce something that already exists you’d need a 3D scanner, which costs thousands. So Shapeways is actually aimed at people with 3D CAD software used by small businesses and will eventually offer its own online CAD tools. The site uses 3D industry standard file formats (STL, Collada, X3D) and the average cost of objects is $50 – $150. At the moment it looks like they are limited to desktop-sized pieces, but perhaps we’ll one day see Star-Trek-style printing of bigger objects. Shapeways is a spin-out startup from an incubator programme at Philips Electronics, in Eindhoven. The CEO is Peter Weijmarshausen, formerly of 3Dsoftware package Blender, and he has a team of 10 people. They plan to be out of private beta in a couple of months. Update: Notionally they compete with US-based Ponoko, which allows people to mass customise and make bracelets, brooches, earrings etc and items like wooden coasters. But Shapeways looks capabale of more complex modelling. TechCrunch readers can sign up for 500 beta invites here using the Beta Code: “TechCrunch100”.